My energy was too low to roam around the streets of Kuala Terengganu to find a local eatery. And 8:30 PM was already late for opening hours of food places in the city center. The 8-hour bus ride from Kuala Lumpur leads me to the doorsteps of KFC for my first meal on this side of Malaysia. 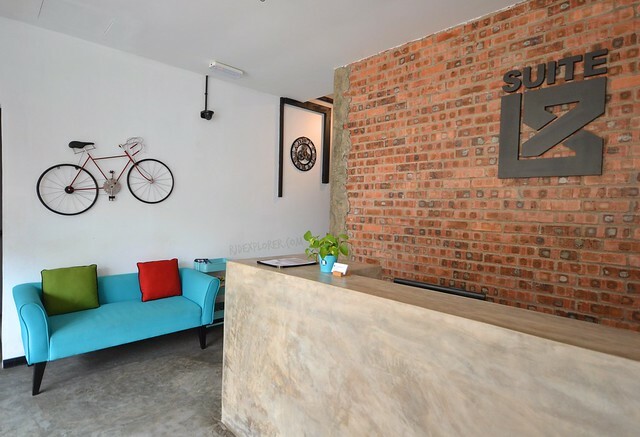 From the food chain, it was great to find out that Suite 18 Boutique Hotel is just a few blocks away. A 7-11 is a landmark based on their website information. Walking few steps along Jalan Kampung Cina still, can’t provide any sign of the convenience store. Few more shophouses, I enjoyed the several steps to the hotel’s front-desk. Three bicycles greeted me and pleading for me to rent one during my stay in Kuala Terengganu. 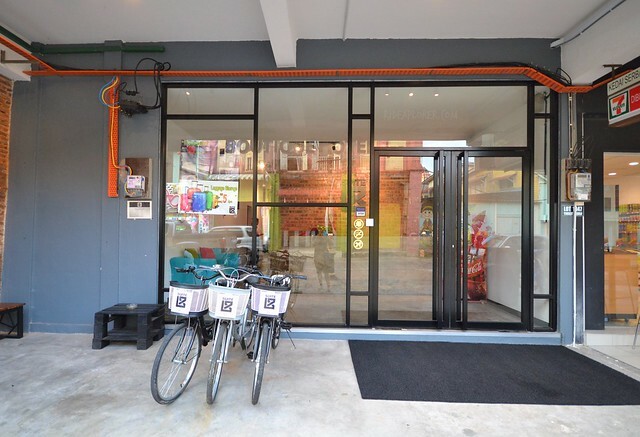 Suite 18 Boutique Hotel also rents bicycles on your roam around the city. It was 9 PM and the crew at the front office still was able to offer his wide smile upon check-in. I settled the MYR50 deposit fee and after signing the forms, he handed me the key card and locker key. Dormitory rooms are on the top most floor of the building and they don’t have a lift. I prepared my little energy and started scaling the stairs. It was funny that I was pushing the door of the room and had no idea that it was a sliding door. I almost broke the wooden door of the dorm at nine in the evening while others are at the comforts of their sleeping pods. Suite 18 Boutique Hotel’s bunk beds. The hotel currently has three dorm rooms, each can accommodate up to six people. One of the rooms has windows making natural light comes in, which is I really liked. If this bothers you, there are reasonably thick curtains covering the glass windows. Sleeping pods are quite spacious than normal and there’s a space on the side where you could put your stuff. Suite 18 Boutique Hotel’s dorm beds and free welcome treats. 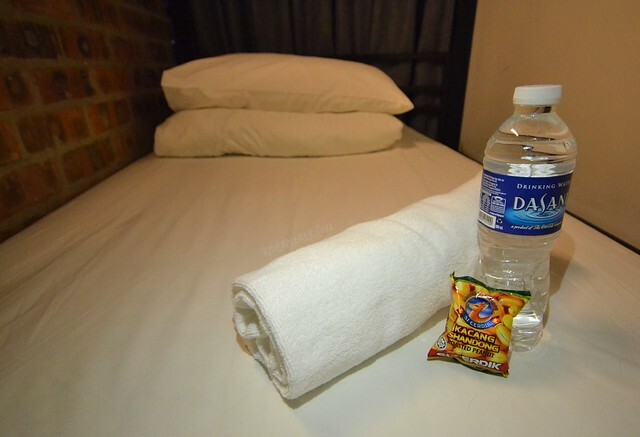 My bunk has fluffy pillows, a rolled fresh towel, bottle of water, and free welcome treat, a pack of nuts. In addition, the mattress is covered with clean sheets and has a duvet. To secure your valuable items, lockers provided have ample spaces and can swallow medium-sized luggage or even a 32+ liters backpack. Shared toilet and shower cubicles are on the same floor. 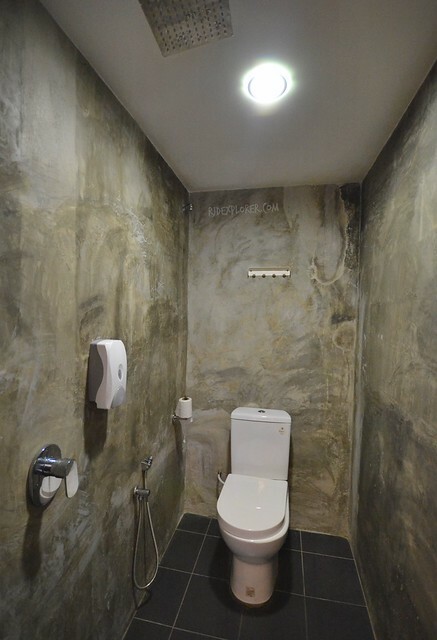 There are six spaces and each includes the toilet and the overhead rain-shower. Shampoo and body soap are provided for free. I think I need to mention that the shower cubicles are very spotless. On the other hand, sinks have pop-up sink drainers you can use for washing few clothes. There’s small balcony on the dormitory floor has a drying rack perfect to dry your laundry. Super clean toilets and shower area of Suite 18 Boutique Hotel. 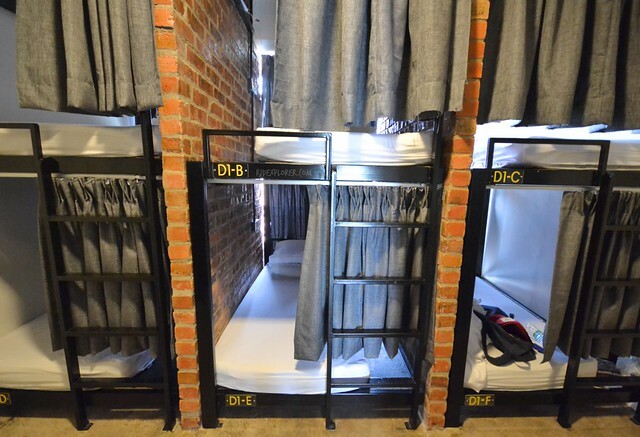 In addition to the shared dormitories, Suite 18 Boutique Hotel has 3 floors of private rooms from twin, triple, and king room types. 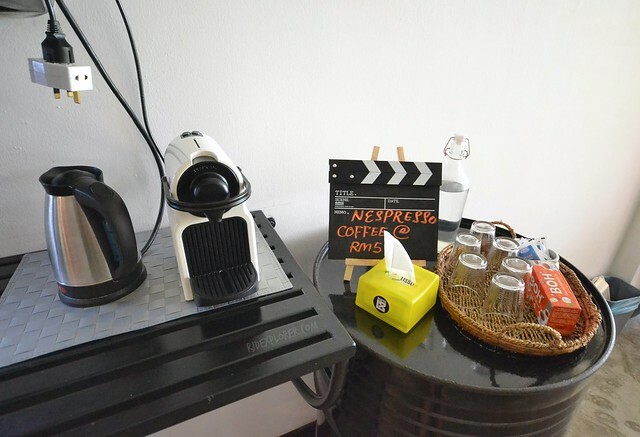 Apart from private accommodation, in-room facilities and amenities are en-suite bathrooms, coffee and tea making facilities, flat-screen television, and shower essentials. Some rooms have no windows while other offers a view of the city. Near the front-office is a colorful couch for guests waiting for their check-in time or just simply lazing at the hotel. 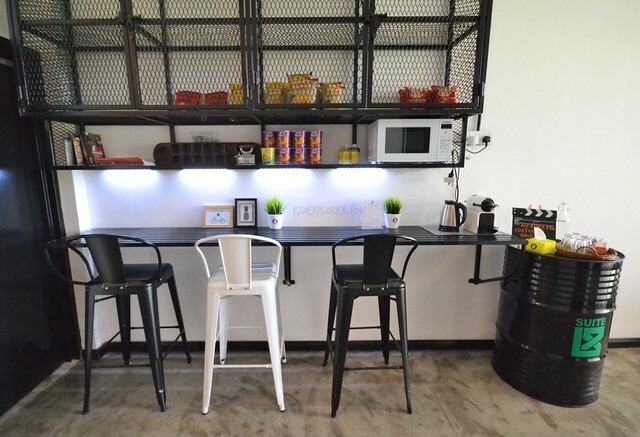 Few meter is a counter where you can buy cup noodles, chips, drinking water, and brewed coffee. A microwave is available for some reheats and a free drinking water. 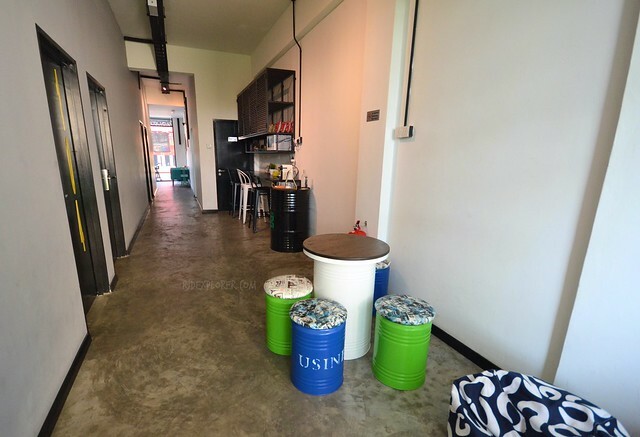 Innovation is very visible in their common areas like the way the storage drums converted into funky tables and chairs. Common area on the hotel’s ground level. Free water and Nespresso for sale. 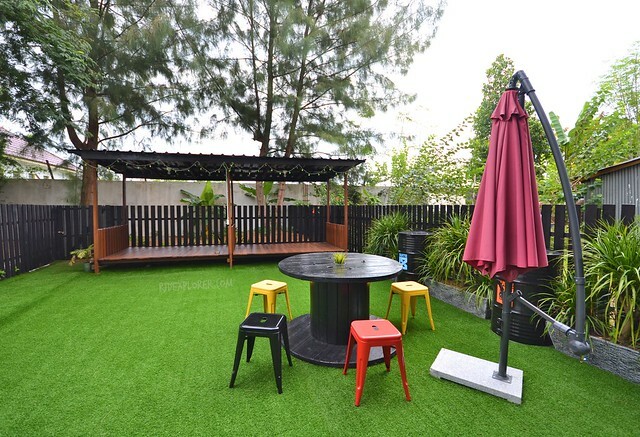 Meanwhile, the backyard of the hotel is carpeted with artificial grass and perfect venue for some getting-to-know sessions with fellow travelers. The entire garden is bordered by a wooden fence. A wooden bunk is in the rear area and blends well with the towering trees. Bean bags and few chairs can join you on your restful day at the garden. Cool hang-out area at the back of the hotel. 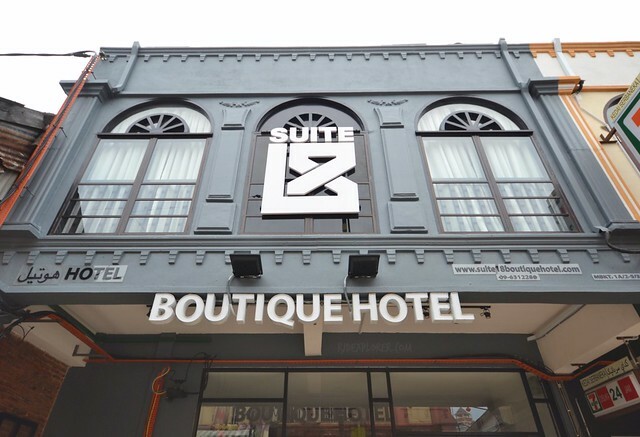 Suite 18 Boutique Hotel is at the center of Chinatown making it accessible to Chinese restaurants and vibrant alleyways. A hundred meters away is Pasar Payang, the central market of Kuala Terengganu located near the Terengganu river. Visit the market for some food finds from skewers to fresh fruits and durian! Meanwhile, Majlis Bandaraya Kuala Terengganu (MKBT) bus terminal is a 10-minute walk from the hotel. 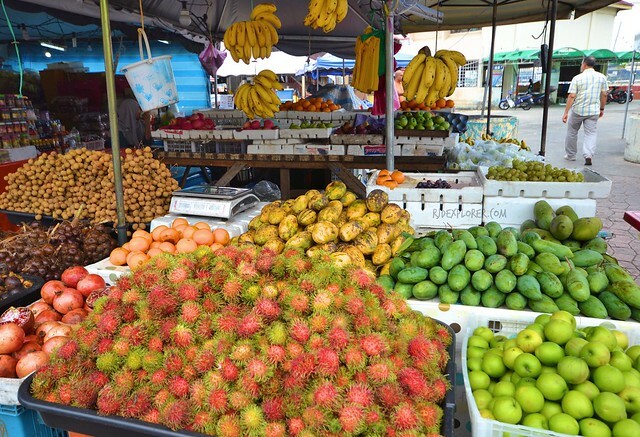 Fruits available at Pasar Payang. Some of the tourist attractions you can visit while in Kuala Terengganu includes the Masjid Kristal (Crystal Mosque), Tengku Tengah Zeharah Mosque (Floating Mosque), Terengganu Museum, and Terengganu Inscription Stone. There are also beaches on the west side of the city and islands for some quick beach getaway. Don’t miss this facade when you’re in Kuala Terengganu. Kuala Terengganu is not a usual destination in Malaysia where tourists spend quite time to explore. 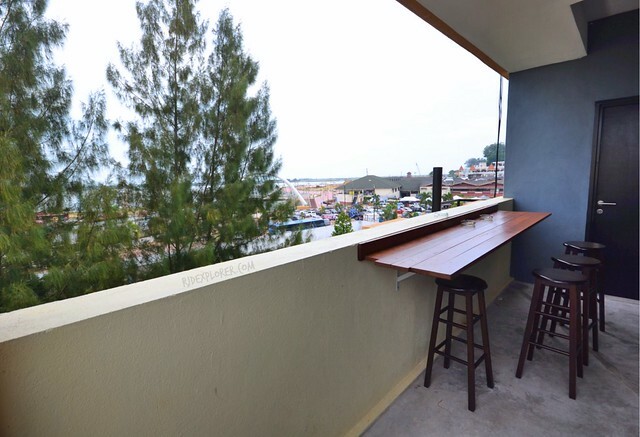 It is normally considered as a short stop when going to Perhentian or Redang Islands. But during my stay, Kuala Terengganu has its own heritage and cultural beauty that are worth exploring. 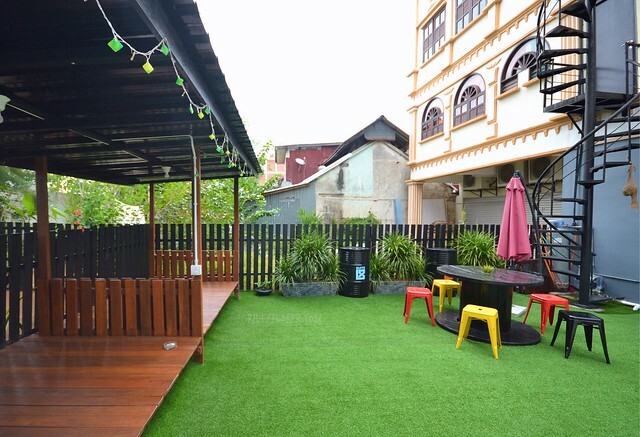 Availability of budget accommodations, like Suite 18 Boutique Hotel, encourages foreign travelers to stay not just for a night but few days in the colorful city of Kuala Terengganu.